The entertainment industry is the toughest business around. To achieve success as a professional screenwriter, you will need every advantage you can get. A writer who faces readers, agents, producers and creative executives is no different than a soldier going into combat. To have the best chance of survival, both would be wise to bring every weapon they can carry into the fight. This book is ammunition for the battles every screenwriter will face as it teaches: How to create a bulletproof outline, How to build and breathe life into compelling characters, How to defeat crippling procrastination, How to avoid being ripped off, and How to deal with a myriad of situations other books never mention. The one thing this book will not do is tell you what the proper margins are for a screenplay, where to place a parenthetical in dialogue or what is supposed to happen on page 30. There are dozens of books and free online lectures for that. Maximum Screenwriting was written for one reason only: to teach you what other books don’t and to tell you what other writers won’t. When it comes to writing and producing, Jeff Schimmel knows what he's talking about. His tips and techniques will have an immediate, positive impact on your work. It's a fun read from a well-credentialed working writer, who generously provides loads of practical advice found nowhere else. A very good read! Straight to the point and extremely informative for up and coming screenwriters looking to break into the business. 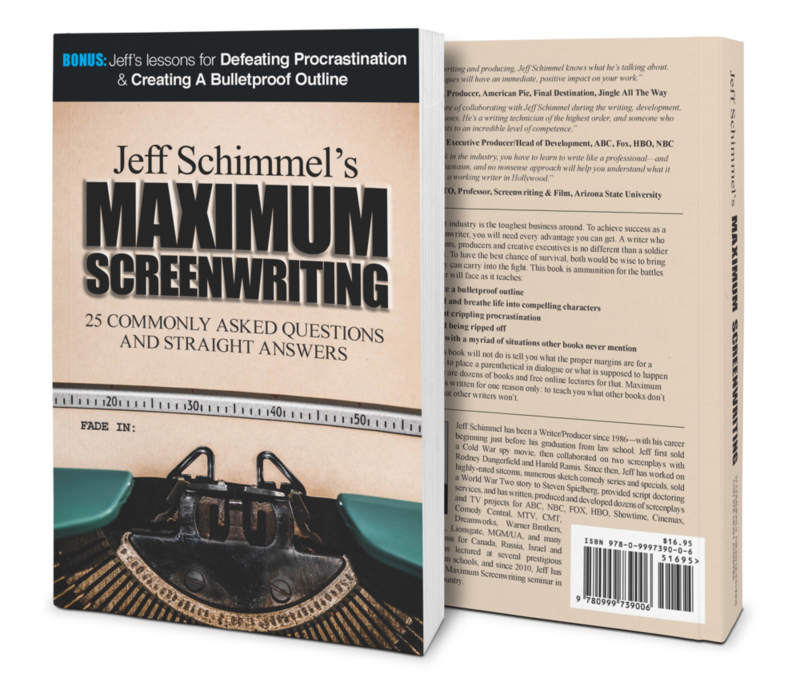 This book is a "must have" for anyone who is serious about their screenwriting career. Jeff writes with a great sense of humor and more importantly he "tells it like it is." For example, you will be blown away about his advice about entering screenplay contests - or not! Also, Jeff's book is up-to-date and "hot off the press." The book was great. It covered topics that other people were timid to speak about. I wish I would have found this book years ago. Thanks Jeff for a fantastic masterpiece. Some great insight into the fundamentals of being a successful screenwriter. I just completed a workshop with Jeff, and the information he provides is invaluable. Read this book if you are serious about screenwriting. Jeff tells it like it is in Hollywood. He's a 30-year entertainment veteran who's walked the talk. His unique experiences keep you engaged and you learn so much along the way. A masterful storyteller. Finally someone came out with the questions that ponders on every screenwriters mind. Its not about format or structure, its about real meat for your final product. Read it. I just had the opportunity to attend one of Jeff Schimmel's screenwriting workshops and he scared the hell out of me! Truth can be challenging. However, "truth will set you free." Jeff is honest and if its the truth you want, then this is the book YOU WANT!! No Bullsh%#! from this writer. Be afraid, but don't be afraid to read this book.